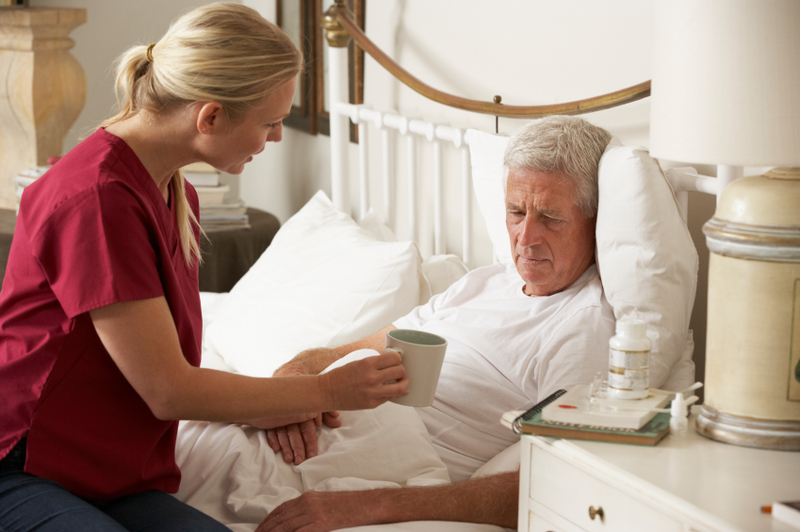 Home » General Health » What Causes Night Sweats in Men Over 50? What Causes Night Sweats in Men Over 50? What causes night sweats in men? For the most part, several of the same factors that give women night sweats are the same ones that affect men, except for the hormonal changes that women undergo in their 40s and 50s as a symptom of perimenopause. That said, night sweats can occur because of a low testosterone level, also known as low T.
It’s difficult to gather proper data about night sweats in men because most men don’t report these instances to their doctors, likely because they don’t think it indicates anything. But the truth is that night sweats can tell your doctor about what’s going on in your body, so it’s important to document these occurrences. But the truth is that night sweats can tell your doctor about what’s going on in your body, so it’s important to document these occurrences. Several factors can cause night sweats, including panic attacks, sleep problems, numbness in hands and feet, fever, anxiety, and trouble breathing at night. Sweating at night can also be a side effect of some medications, including those often prescribed for depression. As men age and get past 40, testosterone levels drop as much as one percent per year. Low T is when a man loses more than one percent per year, and can be a cause of night sweats in men over 50. In fact—the most common cause of night sweats in men is related to low T. Be sure to see your doctor if you are sweating a lot at night so they can check your testosterone level and determine if some kind of hormonal therapy is necessary. A fever is the body’s way of fighting off many health conditions, including bacterial and viral infections. When the body heats up, it releases some of its excess temperature through the skin, which causes excessive sweating. This is a condition in which someone sweats uncontrollably for no apparent reason. With this condition you need to avoid triggers that cause you to sweat; in some cases these are food triggers, such as caffeine, spicy foods, and alcohol. Smoking, while not a good idea in general, can also be a trigger for excessive sweating, so it’s best to avoid this too. A bacterial infection in the lungs can cause fever and chills, which can lead to sweating at night. Night sweats are more common during the acute phase of a respiratory illness. If you’re anxious or stressed, the body sometimes seems to take on a life of its own and act out in ways that deal with the stress. A racing heart, racing thoughts, dizziness, high blood pressure, and sweating at night are all common symptoms of deep anxiety. When the body is tired and burnt out, adrenal crashing can occur. Your cortisol level is typically low during adrenal fatigue, and sweating at night, because of the dip in this important hormone, can occur. Get yourself back to better health by healing adrenal fatigue with a healthy diet. Certain medications can cause night sweats, including prescriptions for depression, anxiety, hormone replacement therapy, and drugs that lower your blood sugar level. 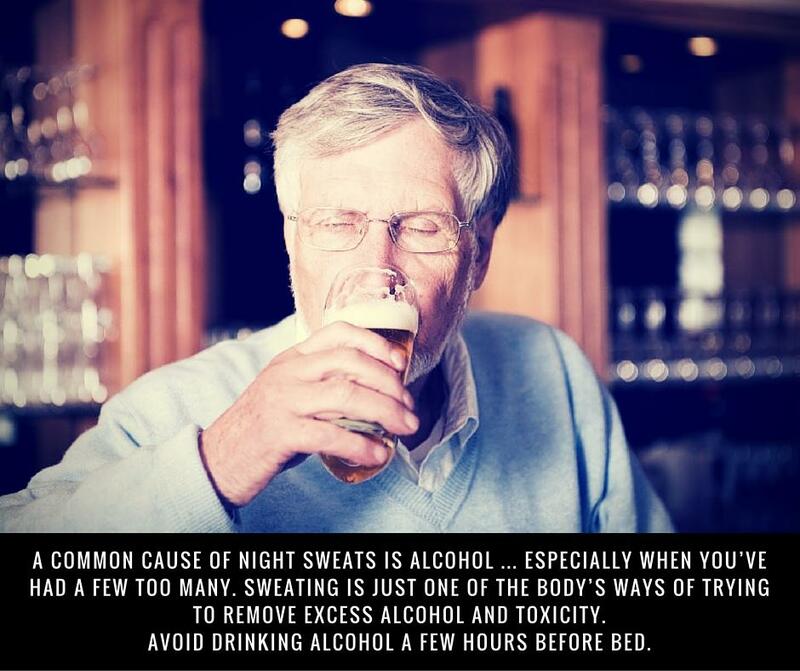 A common cause of night sweats is alcohol, especially when you’ve had a few too many. Sweating is just one of the body’s ways of trying to remove excess alcohol and toxicity. Be sure to rehydrate with plenty of water by drinking some before you go to bed, or in between alcoholic drinks. A less common cause of night sweats is lymphoma, a type of cancer. These night sweats, however, are profuse—you will wake up soaked in your own sweat. See a doctor as soon as possible should you wake up this way for a few nights in a row, as this is a serious cause for concern. Some causes of sweating at night are out of your control, such as sweating as a result of lymphoma. But they’re not all like that. Below are a few ways you can prevent further male night sweats. Avoid drinking alcohol a few hours before bed. 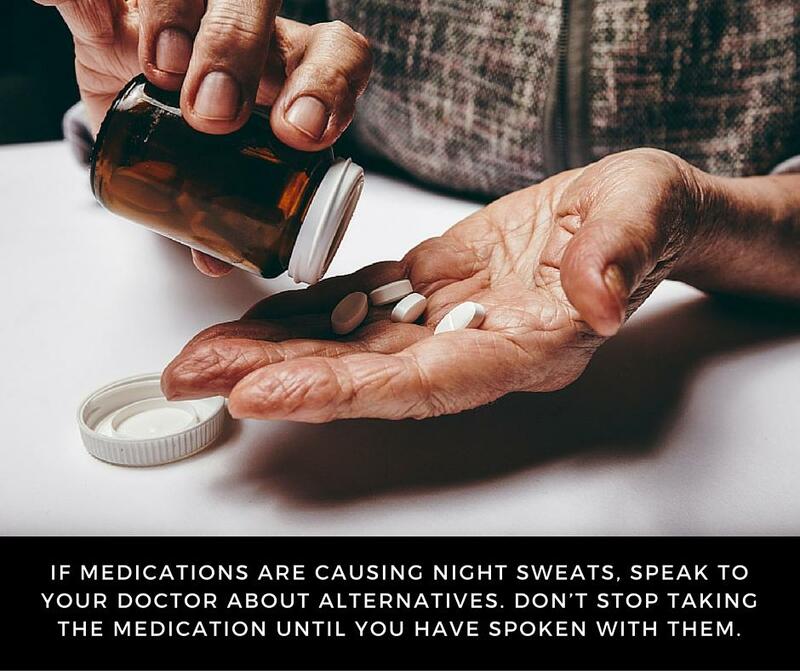 If medications are causing night sweats, speak to your doctor about alternatives, but don’t stop taking the medication until you have spoken with them. Try to reduce the amount of stress and anxiety in your life. Take breaks throughout the day, meditate, go for walks, and unwind appropriately before bed. When they happen on a regular basis. Try to keep track so you can share the data with your doctor. When they interrupt your sleep. When they happen in combination with a fever and other symptoms, such as weight loss. http://www.menshealth.com/health/truth-about-night-sweats, last accessed April 25, 2016.
http://www.mayoclinic.org/symptoms/night-sweats/basics/causes/sym-20050768, last accessed April 25, 2016.
http://www.livestrong.com/article/274141-common-causes-of-night-sweats-in-men/, last accessed April 25, 2016.
http://www.healthline.com/health/low-testosterone/night-sweats#LowT,HighTemps3, last accessed April 25, 2016.